That the greatly admired novelist Kate Christensen has turned to the memoir form after six novels makes this book an event. Readers of memoirs of high literary quality, particularly those with food themes—most conspicuously Ruth Reichl’s Comfort Me with Apples and Gabrielle Hamilton’s Blood, Bones, and Butter—as well as admirers of M. F. K. Fisher and Laurie Colwin will be a large and eager audience. This memoir derives from Kate’s popular foodcentric blog, in which she shares scenes from an unusual upbringing and an unusually happy present-day life, providing an audience for this book that is already primed. That it is written by Kate Christensen means it will be a delicious reading experience in every sense—a compulsively readable account of a knockabout life, full of sorrows and pleasures, many of the latter of the sensual, appetitive variety. I’ve often thought that eating, writing and living well required similar qualities: creativity, daring, the ability to savor the good stuff and learn from the bad. 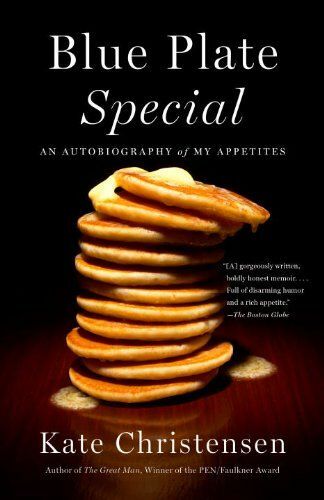 Blue Plate Special is the memoir of an utterly original thinker, a free-spirited gourmand, and a great American writer. It’s an expert guide on inspiration, ingenuity, heartbreak, buoyancy, home, love, family, screwing up, bouncing back and perfecting the bacon-cheddar biscuit. Kate Christensen’s prose has always been dazzling and brilliant even as it amuses and entertains. In Blue Plate Special, she applies her formidable talent to a memoir about the role of food in her (not always easy or kosher) past and present. The result is a glorious feast of meals, prose, and life from one of our finest writers today—a banquet of a book about eating, loving, and overcoming, to be devoured as fast as one’s fingers can turn the pages. I would like to know if Kate Christensen will be reading anywhere in the Boston area this summer -Porter Square Books or Harvard Bookstore? I, too, would like to know if Christensen will be reading anywhere this summer. Since she’s in Portland now, I’d suggest bookstores in Portsmouth and Newburyport, too. Love all her novels, grew up in downeast Maine, and share the same birthday! I caught just a couple of Moments of the interview on NPR…. Looking forward to reading the book!! I heard the NPR interview and was thrilled to find Blue Plate Special on Audible.com. But after listening to the overwrought narrator for five minutes, I had to return it. I’ll definitely make a point of reading this book, but the voiceover-actress seems more interested in showcasing her own perfectly-polished elocution skills than in bringing this rich story to (real) life. Her vocal performance was so distracting that I couldn’t ‘hear’ the writing–only the narration. The author would have done a much better job–I loved the passages she read on Fresh Air. I look forward to buying the book. I had the good fortune of tuning in to the Fresh Air interview on July 10. Today, exactly 24 days later, I am still haunted by Kate’s reading of “Breakfast at McGee.” Perhaps it was the rich detail (“being terrorized, with an inward panicky terror”) or perhaps it was the story itself. I very much look forward to reading this book. I read the book, passed it on, but forgot to write down the roasted squash soup recipe. can you send it? Thanks! Peel, core, and chop a small butternut squash and 3 apples into bite-size pieces. Peel and cut up a red onion. Coarsely chop a knob of ginger and peel 8 cloves of garlic. Coat everything in peanut oil and roast on a cookie sheet for 40 minutes or so at 375 degrees, or until everything softens and caramelizes. Puree with enough chicken broth to make a thick soup, adding half-and-half as desired. Salt and pepper to taste. Heat in a saucepan. Serve in large shallow soup bowls with goat cheese and toasted pine nuts on top. I just finished reading Blue Plate Special by recommendation of a friend. I was moved by your sincerity, insight and resilience. There are some parallels to my own life…the abusive father, multiple marriages, parental alcoholism & drug use, many moves, blooming late emotionally & mentally, infidelity, divorce, younger men and finding peace. I identified deeply with so many of your thoughts and emotions. Reading your memoir felt like a conversation with a friend who would understand where I’ve been, what I’ve seen and who I am as a result. Thank you for sharing and inspiring! I wish there was a way to write you other than this public place. I just read the Elle article which I definitely and unfortunately related too. I didn’t have the abusive father but the abuse of trust is something I am all too familiar with. I found it so amazingly wonderful to see how you were treated so wonderfully with regard to your telling your truth. This is not always the case with this type of thing. But it does give some courage to those who have their own stories to tell and have kept secret for long years.. My mind swirls with questions and wondering if you ever email commenters. I’m imagining that you have been swamped with similar requests given the hugely popular magazine your article was in. I am not an author but I’d love to give you a book idea………how many times do you get that? Anyway ..if it’s meant to be it will. Write if you want to hear my story. With that said, how wonderful that you are happy and relieved of horrible scary thoughts. I wish all happiness for your future and success. Thanks for writing for all the souls out there that wish they could do the same. I hated all the sadness in your life — but I hope the days ahead of you will full of more contentment. You write vividly — humorously — and frankly. OMT: My mother made us a similar dish when we were children that she called Toast Eggs. I had never met anyone else, other than you, that was familiar with that dish. When you described it as a breakfast of your childhood, your description brought back nice memories — my father, when he prepared it for us, always managed to leave us a few slivers of shell. My mother made it perfectly. Hi! I just received Blue Plate Special as a gift from my favorite farmer. I was happy that the Sporkettes made it in! I tore through the book – a delight, a page turner, a thoughtful journey…and the joy of your song, as well as writing is nice to remember. It’s great to hear your voice through and through. Come read in Brattleboro some time! In September of 2012, you published a beef pho recipe in the Wall Street Journal. I’ve lost the last page. Unfortunately, it’s no longer on the website. Would it be possible to send me the recipe? 1. In a large pot, bring 1 inch of water to a boil. Add marrow bones and brisket, cover and steam for 15 minutes. 2. Meanwhile, char ginger under broiler, turning it until blackened all over, about 10 minutes. When cool enough to handle, scrape off blackened skin. 3. In a soup pot, bring 6 quarts of water to a boil. Add bones, brisket and ginger to pot. Simmer 5 hours, then remove brisket and set aside in refrigerator. Simmer broth 8 hours more, skimming impurities from top occasionally. 4. Near the end of simmering, place a skillet over medium heat and toast star anise, cardamom, cinnamon and peppercorns until fragrant, about 3 minutes. Put spices in a piece of cheesecloth and secure with kitchen twine to make a sachet. Add sachet to broth along with salt and sugar. Simmer 30 minutes more. Remove sachet and bones. Strain broth and keep hot. 5. Put noodles in a bowl, cover with boiling water and soak 10 minutes. Rinse under cold water and drain. 6. Slice onion and scallions very thinly. Thinly slice reserved brisket and raw sirloin against the grain, discarding fat. Divide noodles, onions, scallions, brisket and sirloin among four serving bowls. Pour hot broth into bowls. Serve immediately with basil, cilantro, sprouts, chilis, lime wedges and Sriracha and hoisin sauces on the side, for garnish.